Zero Plus Feminine is a perfume by Diesel for women and was released in 1999. The scent is fruity-spicy. The production was apparently discontinued. 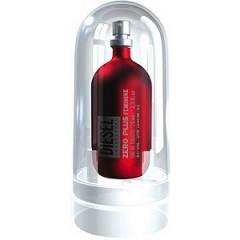 "Diesel Zero Plus Feminine" is one of those scents that at first glance you don't know what to expect from, the notes could turn out either way and the bottle looks very *industrial revolution*. When you take the bottle out of its plastic box, it has no cap, so its very bare and minimalistic looking and is -in my opinion- more suitable for a male fragrance. On my skin the first whiff reveals a creamy pineapple with a coconut note, a warm vanilla aura and a pinch of nutmeg/pepper. In the middle phase magnolia and sandalwood appear and they persuade a shy amber to accompany them. Just when you think its gourmand all the way the magnolia gives it a floral vibe and settles in a sandalwood/ amber drydown, but the pineapple is never far away. It's a scent one loves or hates. So many things can go wrong with this (the pineapple can be perceived as sour on some chemistries) and I can understand people who say that they don't like it. It is indeed a scent that is fickle and very moody, but if it works with your chemistry you have a scent that is quite unusual and definitely not mainstream! I like it for those moods when I crave something very different from the rest of my collection. It also suits my: "I wanna be on a tropical island" mood. It's a coconut-vanilla gourmand with a slight boozy edge (pineapple) and its yummy and sweet with a spicy backbone. It's definitely a scent you must try and wear a while before purchase because it's really that *odd*! I tried this because I love the scent of coconut, and I read here that this fragrance smells a lot like it. Well let's just say I didn't get coconut from this at all. Instead I got a sour, synthetic, nasty smell. This is definitely a perfume that I would not recommend to anyone. Write the first Review for Zero Plus Feminine!